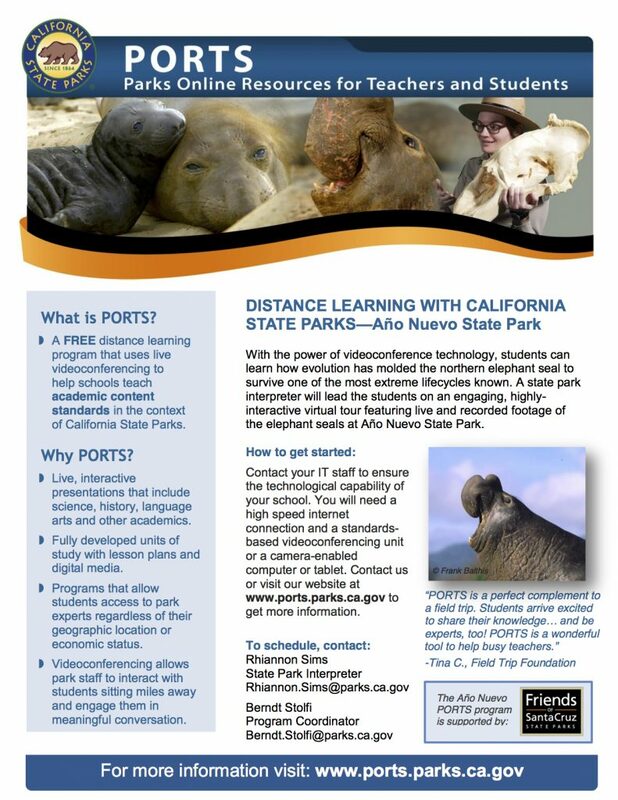 Parks Online Resources for Teachers and Students (PORTS) is a free distance learning program that uses the power of interactive videoconferencing to help K-12 schools teach common core state standards in the context of California State Parks. PORTS is located at Seacliff State Beach. Friends of Santa Cruz State Parks proudly provides full funding for the PORTS program at Seacliff State Beach, which served 8,334 students across California in 2014. In addition to Seacliff, PORTS programs are based at several State Parks and Beaches throughout California, including Anza Borrego, Crystal Cove, California State Capitol, Columbia, Hearst Castle and North Coast Redwoods. Each program features live, interactive videoconference presentations on science, history, language arts and other academic topics. The programs also include units of study to prepare and assess learning, and the service is free for schools to use. To learn more about the PORTS program, visit www.ports.parks.ca.gov.